The collection will be donated to TMAG in three stages, with the first stage comprising 23 works by several notable artists such as William Robinson, Andrew Sibley, Euan McLeod, John Gould and Jock Clutterbuck, who are not otherwise represented in the TMAG collection. Also amongst the collection are significant paintings by James Gleeson, Clifton Pugh, Imants Tillers and Stephen Lees, which will augment the collection of existing works by these artists already held by TMAG. The donation makes a valuable contribution to TMAG by bringing a greater national context to our collection of Tasmanian artworks from the colonial period to the present day. The private collection has been donated by Anna and Richard Green, who are keen to share their love and passion for these works with a broader audience. They also hope their gift may encourage others to consider making a donation or bequest. “I believe that works of art are a gift to the world,” Anna said. “My feeling is that these gifts to the world need to be shared. “We have been the owners of these works but in reality we have been their custodians. The works have been offered to TMAG through the Australian Government’s Cultural Gifts Program which provides tax incentives to encourage people to donate cultural items to public art galleries, museums, libraries and archives in Australia. This donation will help TMAG to fulfil a strategic goal to strengthen and develop its collections of contemporary art through the acquisition of works of exceptional quality and significance. One of the donated works, The Shooting of a Kangaroo by Australian artist Clifton Pugh, is currently on display in the Modern Age Gallery at TMAG. An exhibition of the donated works is planned for March 2018. 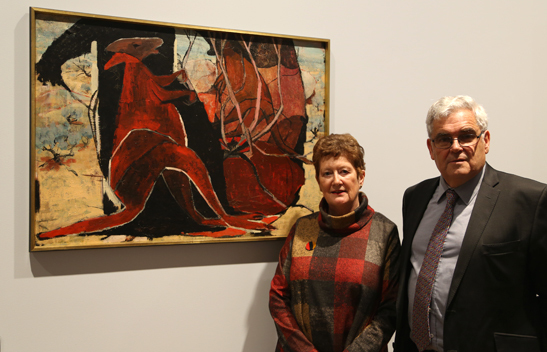 Image details: Anna and Richard Green with Clifton Pugh’s work The Shooting of a Kangaroo (1956), currently on display in TMAG’s Modern Age Gallery.